(CNN) -- A big part of being president is making decisions, and one of the key decisions a would-be president can make is who he or she marries. Cindy McCain has a master's degree in special education. She is part owner of her father's business. It's not like deciding whether to press the nuclear button, but first ladies in the United States can wield enormous influence in politics and in society. They're not elected. They're not paid. There's no precise job description. But whether it's an elegantly dressed Jacqueline Kennedy giving Americans a tour of the White House, Eleanor Roosevelt speaking on civil rights or Hillary Clinton saying "I suppose I could have stayed home and baked cookies," first ladies are praised, criticized, adored and scorned -- but never ignored. McCain is the only child of a wealthy Arizona businessman, James Hensley, founder of Hensley & Co., a major distributor of Budweiser beer. Her stake in the business is estimated to be at least $100 million. She refused to release her full tax returns, saying "I am not the candidate," but later provided summary pages of her 2006 taxes without details. 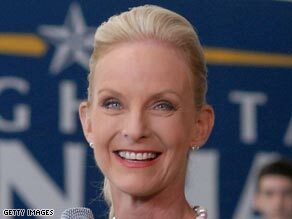 Cindy McCain has a master's degree in special education. She met John McCain in 1979 when he was the U.S. Navy's liaison to the Senate. He was 18 years older than she. He divorced his wife and married Cindy in 1980. The McCains have four children, including a daughter adopted from an orphanage in Bangladesh. A tall, striking blonde with blue eyes, Cindy McCain has had health issues including a near-fatal stroke in 2004 and a battle with prescription drugs that she says is behind her. In an interview with CNN, McCain said her priority in life is charity. "I've been internationally involved in many, many things," she said. "Land mine removal, children's health care, poverty around the world -- and I will continue that." On the campaign trail, always dressed impeccably, she stays "on message" but did take a swipe at Michelle Obama after her statement, "For the first time in my adult lifetime, I'm really proud of my country." "I don't know about you," McCain said in February, "...I'm very proud of my country." Michelle Obama has a blunt style and a wry, quirky sense of humor that goes over well with supporters. She doesn't mince words. In an interview with CNN, she said, "I think race is always -- still, in this country, it's always on the table." Michelle Obama was raised in a working-class family in Chicago, Illinois, but educated at some of America's elite universities: Princeton and Harvard Law School. She was hired by a top-flight law firm in Chicago and met Barack Obama when she was assigned to mentor him. They married in 1992 and have two young daughters. Michelle Obama cuts an impressive figure -- tall, slim and dressed in Jackie-Kennedy-like sheath dresses. If her husband is elected, she will make history as the first African-American first lady. She has given insights into her husband's domestic behavior: He doesn't pick up his socks. Cindy McCain praises her husband as a fighter who won't give up. Will we learn more of substance? Their husbands offer starkly different views of what they would do in office and Americans often look to their first ladies as a window into the thinking of the president.